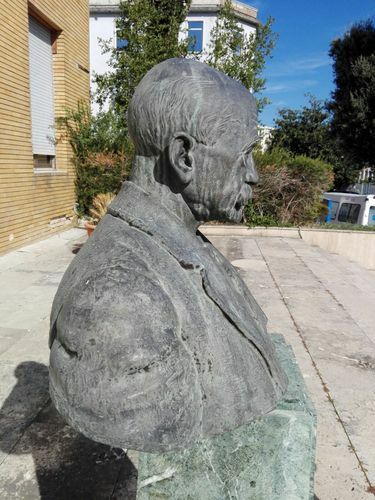 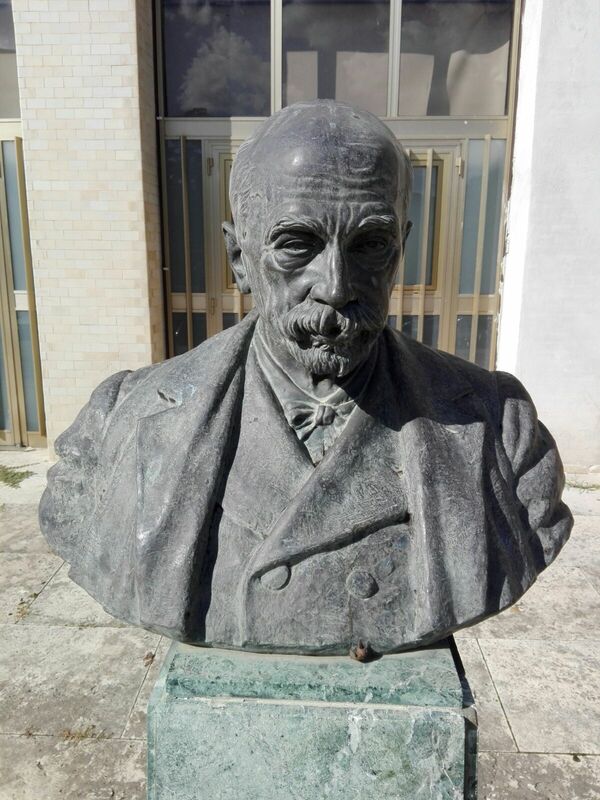 This bronze bust of Felice Migliori can be found in the courtyard leading to the main entrance of the “Ospedale Civile dell'Annunziata" in Cosenza and remembers one of the most influent surgeons of his time. Few days before his death, exactly on 19th april 1915, the citizenry decided to dedicate him a bronze bust where the memorial tablet remembers the greatness of his work, always with a strong feeling of charity1. 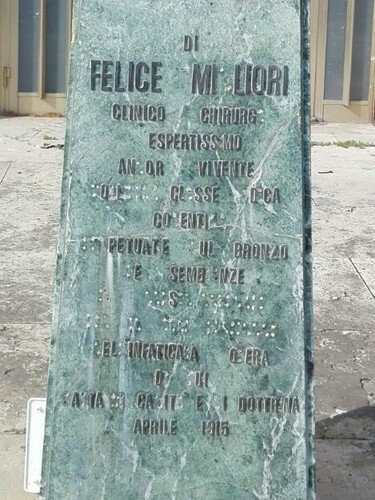 The original Italian inscription reads as follows: “DI/ FELICE MIGLIORI/ CLINICO CHIRURGO/ ESPERTISSIMO/ ANCOR VIVENTE/ VOLLE LA CLASSE MEDICA/ COSENTINA/ PERPETUATE SUL BRONZO/ LE SEMBIANZE/ IN QUESTO OSPEDALE/ PER QUARANTA ANNI TESTIMONE/ DELL’INFATICATA OPERA/ DI LUI/ FATTA DI CARITA’ E DI DOTTRINA/ APRILE 1915”. 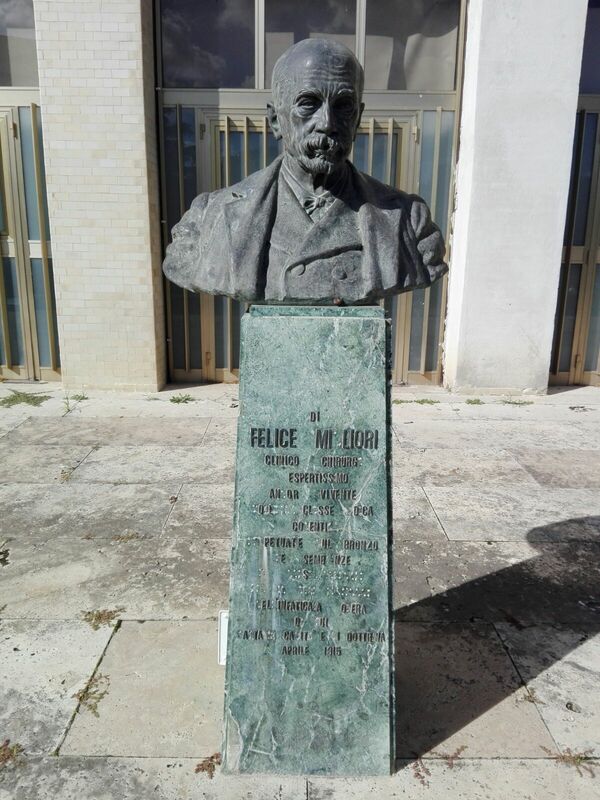 Unfortunately the text is not in good conditions, but the same inscription is written on another bust situated in the General Surgery department's waiting room of the Hospital. 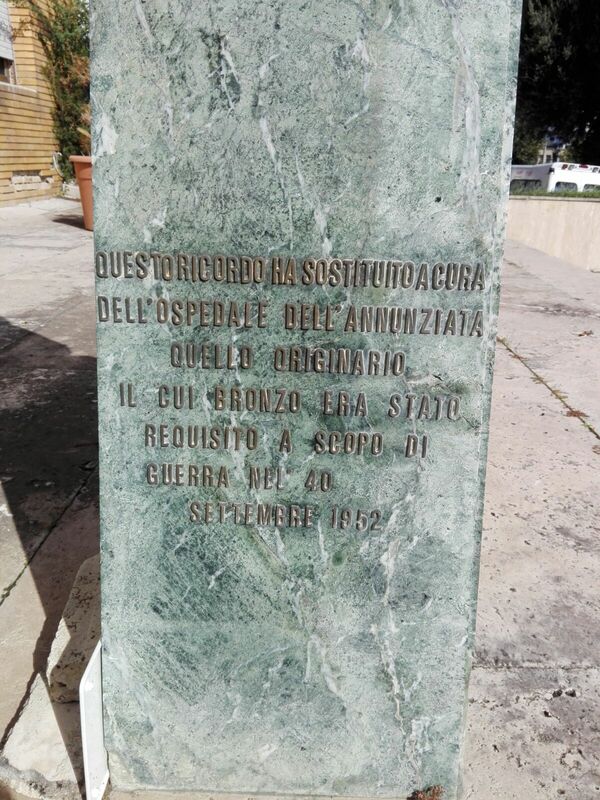 The original bust does not exist anymore, because during the Second World War it had been used to obtain weapons and ammunition2. 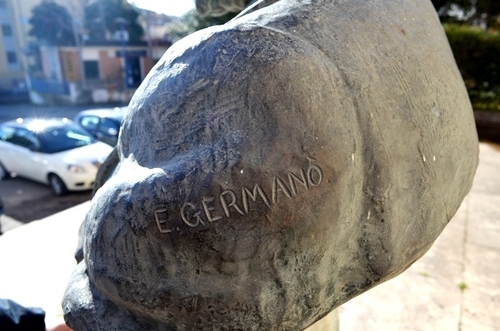 As the insciption on the left side says, this reproduction was scuptured by Ermanno Germanò . On the right side of the pedestal there is another inscription which explains that it is a reproduction realized on September 1952: “QUESTO RICORDO HA SOSTITUITO A CURA/ DELL’OSPEDALE DELL’ANNUNZIATA/ QUELLO ORIGINARIO/ IL CUI BRONZO ERA STATO/ REQUISITO A SCOPO DI/ GUERRA NEL '40/ SETTEMBRE 1952”. 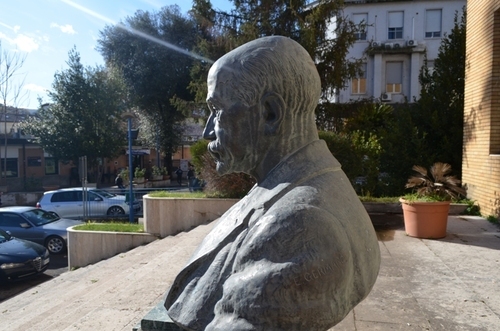 - Antonio Petrassi, L'Ospedale dell'Annunziata ed i Grandi Medici calabresi, Editoriale Bios, Castrolibero 2005, pp. 92-94.